Since exploding onto the global stage in 1993 with the multi-platinum Tuesday Night Music Club album, the one-time music teacher and studio vocalist from Kennett, Missouri has forged a career to become the finest female singer/songwriter of her generation. 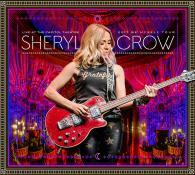 On November 10, 2017, at the historic Capitol Theatre in Port Chester New York, Sheryl Crow played the final night of her Be Myself tour. The show features Sheryl with her all new band in top form, performing new songs from her 8th studio album. featuring the Title Track Be Myself along with her newest hits Halfway There and Atom Bomb , and featuring her classic hits including Comon' Comon All I Wanna Do, Leaving Las Vegas , First Cut Is The Deepest, Soak Up The Sun, If It Makes You Happy and many more hits. This Film also features a vintage Black and White flashback introduction of many Legends who have graced the Capitol Theatre stage over the years, interspersed with exclusive interview segments with Sheryl recently filmed at her Farm in Nashville. Bonus features include: Includes a vintage Black and White 'Flashback' introduction of many legends who have graced the Capitol Theater stage over the years, interspersed with exclusive interview segments with Sheryl recently filmed at her Farm in Nashville, TN.